From left to right: Ian Macara, Cate Searle, Ian MacKendrick, Chris Moon-Willems, Richard Bates. Thursday 22 October 2015 marked Sussex’s first major conference on planning and paying for care. Those attending included representatives from 32 firms of private client solicitors and accountants, and care professionals from the voluntary and statutory sector. 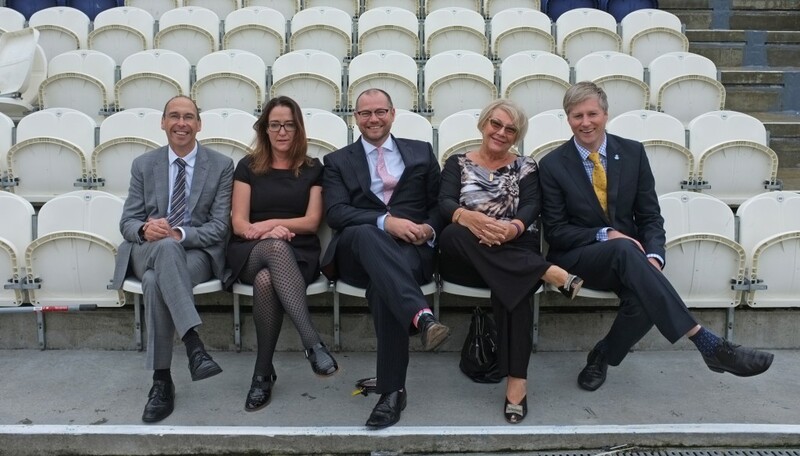 Hosted at the Sussex County Grounds in Hove, delegates from Sussex, Surrey and Kent heard leading experts share their experience and insights on legal, financial and care planning for vulnerable people. The conference was organised in partnership by Martin Searle Solicitors, Frenkel Topping, Rix & Kay, Relative Matters and Bennett Griffin. A total of £1,645 was raised from ticket sales, which has been shared between the conference’s local charity partners: Age UK Brighton & Hove, Alzheimer’s Society, Frenkel Topping Charity Foundation and Headway East and West Sussex. Chaired by Senior Judge Lush, Senior Judge of the Court of Protection, who has an outstanding wealth of knowledge and experience around financial and welfare matters for people who lack mental capacity. The Judge shared some of his recent case law decisions and confirmed the Court’s position on gratuitous care payments to lay Deputies who are also carers. In addition, Judge Lush highlighted the decision made in the case of KS v JR , where Chloe Smith represented the applicant and in which the Judge made a pre-emptive Deputy Health and Welfare appointment. Chris Moon-Willems of Relative Matters talked passionately about her role in arranging person-centred care for her older client group. Ian MacKendrick from Frenkel Topping explained the balance that should be used when providing financial and investment advice for the benefit of vulnerable people and their families. Ian Macara from Bennett Griffin outlined the importance of planning ahead and how to raise awareness so that we are empowering our clients to make informed choices. Richard Bates of Rix and Kay closed the event with a talk about care providers, their roles, responsibilities and the Care Quality Commission (CQC). In addition to providing a valuable learning opportunity, the event gave Professional Deputies and Attorneys and Financial Planners the chance to discuss the key issues that are having an impact on our client group and the best practice approach that can be adopted to make a difference. If you were unable to attend this event but would like to receive the presentation slides from each speaker, we will be offering them up until the 30 November 2015 in exchange of a £10 donation to our charity partners. Contact Sophie on 01273609911, or email sophie@ms-solicitors.co.uk for more information. Based primarily in our Brighton office, I lead the community care law team. As one of a very small number of solicitors specialising in NHS continuing healthcare law, I have built an expanding practice in this area which has given our firm a nationwide profile far and above its relative size. I also provide expert opinion on community care law issues for the specialist press, speak as a guest lecturer and train other legal professionals. In 2011 I was asked by the Law Commission to give my views as part of the consultation on proposals for inclusion in the Adult Health & Social Care Bill.